Ethical brands are an established phenomena in food and clothes production, but up until now there has been no move to develop the fair trade brand into the phone industry. 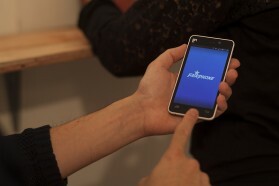 Enter Fairphone. Established three years ago as project within media lab called Waag Society (www.waag.org/en), Fairphone has become an independent social enterprise and been developing five areas in which their phone can be seen as fair: conflict-free resources, fair wages, e-waste solutions, transparent pricing and e-waste solutions. They are now a mere 13 person team encompassing eight different nationalities. Tantalum and Tin are currently both mined out of conflict regions in the Congo. While other phone operators have chosen to move their mining to other regions Fairphone have sought to invest in areas of the Congo not involved in the conflict, thus maintaining investment in the region while not fuelling the problem. They are part of a conflict free tin initiative and the solutions for hope programme. Gold and Tungsten aren’t sourced from fair trade regions and this is another area that they are working on. They have already passed production quality tests for recycled polycarbons, so 30 per cent of the phone will be made from recycled plastics. Holistically they are looking to lessen their dependence on these materials. They have a foundation that does research looking into sourcing fair trade gold and cobalt. In the case of China they have opened dialogue with factories in order to put aside a worker welfare fund from the sale of the phone to promote a living wage in the factories that they operate in. Thus using the economic power of the phone production to promote better wages and conditions. Fairphone started as a campaigning group and chose to make themselves into a crowd sourcing social enterprise in order to look at how the supply chain operated. As such they are working with and not against other mobile phone providers to bring this product to the market. KPN the main carrier in Holland agreed to buy 1,000 phones even before they started producing them. Fairphone have also been talking to Vodafone and T mobile, though there is not a formalised agreement. They currently have pledged sales of 17,235 and are looking to make delivery in December. They only needed to sell 5,000 phones to make it economically viable.